In 2016, we were delighted to be working in partnership with Mr. Men Little Miss for the second time, following our original partnership which spanned 15 years from 1996 – 2011. The partnership was reignited to celebrate Mr. Men Little Miss’s 45th year – kick-starting with a bang, with the Mr. Men Little Miss characters popping up across the breadth of our fundraising activities. During our first partnership the Mr. Men Little Miss Team was very popular with our supporters. Mr. Happy and Mr. Tickle featured alongside the charity logo on our sports vests and T-shirts for all marathon runners, cyclists and challenge eventers. Many of the other Mr. Men and Little Misses appeared in marketing materials. This helped us to raise our profile in charity sports events. This support helped the Mr. Men Little Miss Team raise over £25million! We are thrilled that once again our runners, cyclists and challenge participants will be a part of the Mr. Men Little Miss Team. New running vests, t-shirts and cycling jerseys are being commissioned. The first of them will be sent out to supporters this winter (2016) for those taking part in a sports challenge in 2017. Schools and children’s groups across the country take part in the Mr. Men Little Miss Marathon Challenge. Children are sponsored to do 26 of something – complete 26 star jumps, sing 26 songs or bake 26 cakes, for example. This signifies the number of miles run in a marathon, and, as these children put themselves to the test, they are raising funds for us. We are working with Mr. Men Little Miss on bespoke products to help raise vital funds for Children with Cancer UK. This includes products in the Mr. Men Little Miss Shop, where, during the Christmas period, 20 per cent of the sale of their personalised Christmas stockings will be donated to us. We are pleased to announce that Mr. Men Little Miss will be the face of our 2017 Bake Club. Bake Club is a fun and easy way to raise money for us in your own home, workplace or local community. 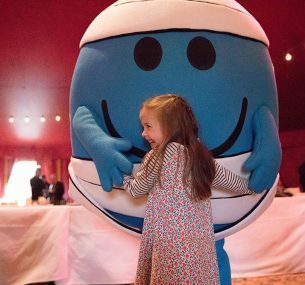 Through this brilliant fundraiser we haveraised £150,000 to date and in 2017 we’re aiming to raise more than ever with the support of Mr. Men Little Miss.